During January and early February Nancy Safay and I have completed a driving tour of the neighborhood, replacing the old black and white FBAC yard signs, as well as placing the new signs at houses with no signs at all. 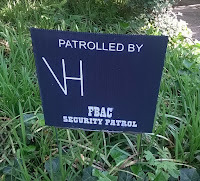 We were astounded at how many FBAC members had no yard signs at all, or still were displaying the old black and white signs. 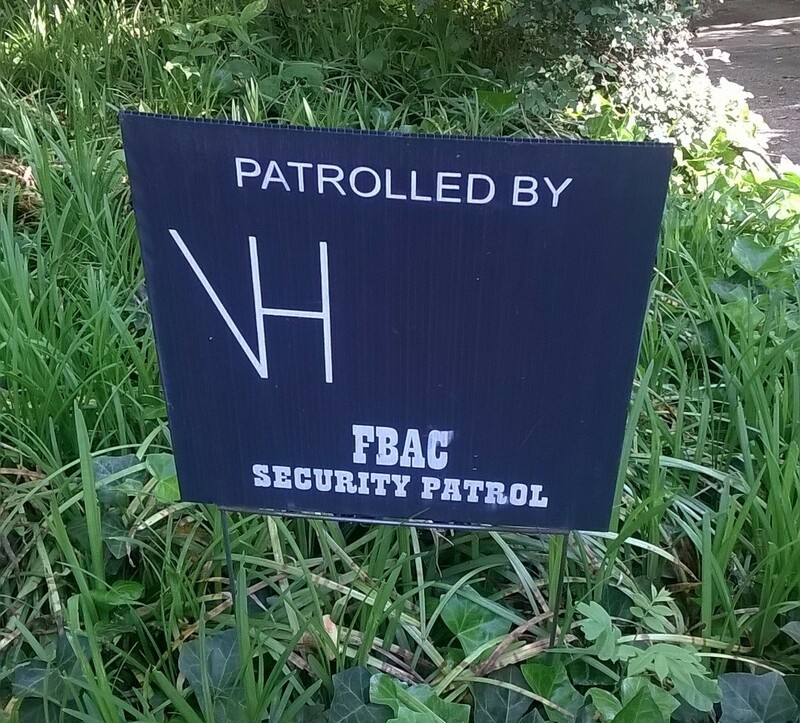 These signs serve several purposes – the first being that this is an immediate visible notification to our FBAC Officers that your house is a paid member for all of the membership services offered. Secondly, your visible yard sign helps to improve the awareness in the community of how many residents belong to this valuable neighborhood service. You are to be commended for taking pride in VaHi and being a FBAC member. As we placed the new signs, we tried to site the signs close to the sidewalk in an area not covered by turf, so they will not be in the way of lawn mowing. We also moved a lot of signs that were hidden in shrubbery next to the house and out next to the sidewalk for better visibility. We also moved a few signs that were illegally sited on the public right-of-way between the sidewalk and the curb and placed them on the private property side of the sidewalk. If we missed moving your sign – please consider moving it yourself out next to the sidewalk to let our Officers and the neighborhood know you are a proud member. For member houses on corner lots, we placed two signs on the property facing both streets. Large numbers, good color contrast, well lit at night. We also found out how many houses in our community have no street numbers or number displays that are not visible from the street. We made our sign trips in the daytime in broad daylight and still had difficulty ascertaining addresses. I am sure that many of you have spent a lot of money to buy plaques or unusual numbers – but if they are not placed above your front door or on the top fascia boards of the front porch in a quickly found location, your purchase has been for naught. If at all possible, these numbers need to be lit also for night-time visibility. Think of the difficulty that our first responders face to quickly find street numbers in the dark of the night – when you are frantically waiting for some sort of help. Street numbers need to be at least 6 inches high, in a starkly contrasting color to the color of your house and illuminated if at all possible. If you have a street-side mailbox – the numbers need to be on both sides of the box and made of a reflective material. If, for some reason, we missed placing a sign at your house – there is a supply of these signs located on my front screened-in porch at 1054 Vance Avenue, NE. Just come by and help yourself to a sign (or two if you live on a corner lot). Editor's Note: John and Nan installed 171 signs including member properties where no sign was present or where old tattered signs were replaced. This effort took them sixteen hours over the course of four days. Give them a hand for taking on this big job. And enjoy the gallery of a few old and worn out signs.